Before the Cuban Revolution, the Arechabala family founded a distillery and made a rum called Havana Club. After the revolution, the revolutionary government seized the distillery, the family fled Cuba, and the new government eventually began selling rum under the same name. Time passes and the Arechabala family sells the “Havana Club” trademark to the Bacardi family (which also fled Cuba and lost their original distillery) along with the recipe for the original Havana Club rum. Bacardi then begins selling a Puerto Rican white rum under the Havana Club name (only in Florida) in a bit of an “F U” to the Castro regime and Pernod Ricard, the French multinational liquor company that got the rum to the international market. More time passes, and with the thawing of Cuban/U.S. relations coupled with international court rulings in favor of Pernod Ricard, Bacardi goes all in with a newly revamped pair of Puerto Rican rums under the Havana Club name. Palate Watery, and dry at the same time, tannic entry, bitter and peppery. Melon and lemon zest come next before being tuned out by saccharin bitterness and white pepper on the finish. Less ethanol on the palate than the nose. The mouthfeel is similarly watery and a bit thinner than the real HC. The biggest difference is the lack of tannins and saccharin bitterness. The vanilla cream is here, and now the artificial fruit flavors now re-emerge with banana and grape, which fade away into a mix of pepper and a bit of saccharin. Winner: Bacardi Havana Club Añejo Blanco by a hair. This one actually surprised me quite a bit, as I have always enjoyed the Cuban Havana Club Añejo Blanco in classic cocktails. Nose Sour cherry and green apple followed by honeydew and vanilla. Fennel and licorice, followed by a pop of fruit esters that can only be described as a “bag of runts candy” in which there are more little bananas than anything else. Beyond the fake fruit is a pronounced dusty note. Finally there is a bit of citrus and pepper. Palate Mellow entry with loads of melon and apple, quickly supported by cinnamon and salted crackers. There is a bit of oak now, along with a touch of caramel. The finish is a bit thin, but otherwise quite pleasant, dominated by the melon and cinnamon with a hint of green apple. The entry is thin and watery. Initial flavors are that of fake banana and caramel. Subsequent sips yield black and white pepper with cinnamon and nutmeg. Now comes a bit of saccharin and tobacco along with oak and vanilla. The short finish is dominated by saccharin and fake banana. Not good. 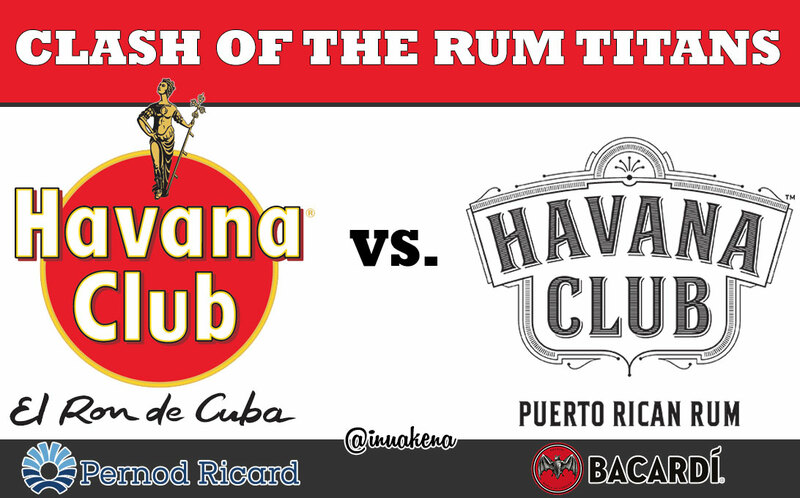 Winner: Cuban Havana Club. No contest here, really. The Bacardi version is pretty bad and has some inexplicable flavors present. So there you have it: one win and one loss apiece. What will happen to the Bacardi Havana Club when Cuban rum imports are again allowed in the United States? Pernod has prepared a U.S. label called “Havanista” which they may actually need to use. Hard to see things changing much in the near term, given the U.S. government has written laws basically codifying Bacardi’s right to sell Havana Club (they must make a lot of political contributions). But for us, at the end of the day it’s about the rum, and from this little experiment, we can see that neither (both?) company can lay claim to being the best rum called Havana Club. What a country. Would have loved to have read this article a week ago. I was in Mexico then and almost purchased some Havana Club Anejo but ended up not doing so as I felt there were plenty of similar Spanish-style rums like it on the US market, AND I worried over a US Customs hassle. Turns out Customs was a non-event so it would have been nice to have bottle in my collection. Oh well. Next time! Your abbreviated history lesson is incorrect. You said “the family fled Cuba, and the revolutionary government seized the distillery….” What actually happened was that the government seized the distillery and then forced the family to leave the country. There’s a huge difference.